Get on track for a career as a Certified Scrum Master where average advertised salaries range from £42,000 to £70,000. But first you’ll need to pass the Professional Scrum Master Certification exam (PSM I). And before you hand over the £100 ($150) exam fee, you need a comprehensive base of Scrum knowledge to stand any chance of passing. To become a Certified Scrum Master you’ll need to answer 68 of the 80 questions correctly in 60 minutes. That’s a passing score of 85% or more. 1. 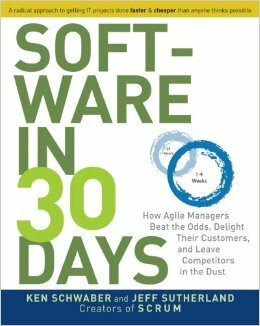 Read "Software in 30 Days: How Agile Managers Beat the Odds, Delight Their Customers, and Leave Competitors in the Dust"
Managers and senior management short on time will find this an especially rewarding read due to its minimalistic and to-the-point style. It’s also ideal for beginners as terminology is clearly defined and numerous examples are provided detailing how companies have used Scrum to cut software development overrun. In fact we like this book so much at Firebrand we included it for free on our 2 day Scrum Master course! For even more reading, take a look at the Official Scrum Guide (another great free resource from Ken Scwaber and Jeff Sutherland). You’ll find an incredibly useful testing resource on Scrum.org entitled the – “Scrum Open assessment”. The Scrum open assessment is an official Scrum.org tool for validating your knowledge (before you commit to the real exam). This practice assessment consists of 30 questions, randomly selected from a larger pool, in which you have an hour to complete. Before you take the Professional Scrum Master Certification exam, we recommend you repeat the open assessment until you feel comfortable completing it in under twenty minutes. Remember – the real PSM I assessment has 80 questions, and only 60 minutes in which to answer them. Don’t attempt the PSM I exam just because you can pass the Open assessment, you’ll still need to do your background reading. Several Scrum professionals even note that some questions found on the open assessment actually appear within the PSM I exam. The Scrum open assessment completely free but you’ll need to register on Scrum.org first. 3. Did you forget about burndown charts? Burndown charts display the remaining effort for a given period of time and are used in Scrum to track product development. But it can be all too easy to neglect burndown charts as they no longer appear on the official Scrum Guide. Despite this, those taking the Professional Scrum Master Certification still report encountering questions related to this elusive subject. Neglect this topic at your own risk - you could still find questions relating to it on your Professional Scrum Master exam. For a comprehensive introduction to Scrum burndown charts, take a look at this article. Use a search engine during this online exam at your own peril. If you find yourself searching for answers online whilst you’re taking your Scrum Master Certification exam you clearly haven’t revised enough! It’s also highly unlikely you’ll find answers to your questions, let alone reliable ones. Plus, with only 45 seconds to answer each of the 80 questions in the PSM I exam, you just don’t have the time to waste. You need the knowledge to be able to answer the questions quickly, without stalling and especially without trawling the internet for clues to the correct answer. The Scrum.org forums are great to browse over a cup of coffee or on a break from your Scrum revision. You’ll find hundreds of fellow Scrum students and certified professionals alike discussing Scrum and agile methodologies. Forums are a great way to ask questions too specific for Google (but remember to validate the information you get!) and a brilliant place to network for both certified and uncertified Scrum Masters. You don’t need to sign up to read the forums, but to participate you’ll need to create a free account. Get on the forums now! Self-study not working for you? Effective self-study doesn’t work for everyone. If you’re one of the professionals that needs the Scrum Master Certification quickly, without the commitment to self-study, take a look at Firebrand’s 2 day accelerated Professional Scrum Master (Agile) course.